This report presents the outputs of the planning workshop for the Rwanda Climate Services for Agriculture Project. The main objective of this planning workshop was to engage key partners in project planning, revise the project’s specific activities, revise the timeline and work-plan for all implementation and monitoring and evaluation activities for the first year of the project. This workshop brought together all project implementation team members, and key partners such as Twigire muhinzi through which the services will be disseminated to farmers as the biggest stakeholders of the project. The implementing team was drawn from the International Center for Tropical Agriculture (CIAT), the University of Reading (UR), International Research Institute for Climate and Society (IRI), the International Livestock Research Institute (ILRI), the CGIAR Research Program on Climate Change, Agriculture and Food Security (CCAFS), Rwanda Agriculture Board (RAB) and Rwanda Meteorological Agency (Meteo-Rwanda). The two days planning meeting came up with an activity plan for all the four outcomes of the project, with responsible institutions and key partners for implementation. The report includes the process of the workshop, brief summary on presentations made, and the key summary and action points from the meeting. Nsengiyumva G, Kagabo DM, Birachi E, Hansen JW. 2016. 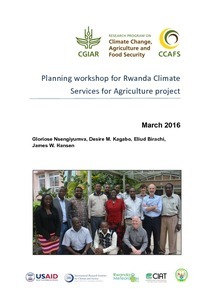 Planning workshop for Rwanda Climate Services for Agriculture project, March 2016. CCAFS Workshop Report. Copenhagen, Denmark: CGIAR Research Program on Climate Change, Agriculture and Food Security (CCAFS).